This week we release new data generated by our Face-o-Matic tool, developed in collaboration with Matroid, adding to our list of public figures detected by facial-recognition on major cable news stations on the TV News Archive. Detecting faces on TV news and turning them into data provides a new quantitative path for journalists and researchers to explore how news is presented to the public and compare and contrast editorial choices that individual networks make. This new measure shows us the duration that politicians’ faces are actually shown on screen, whether it’s a clip of that person speaking, muted footage, or a still photo shown in the background to illustrate a point. 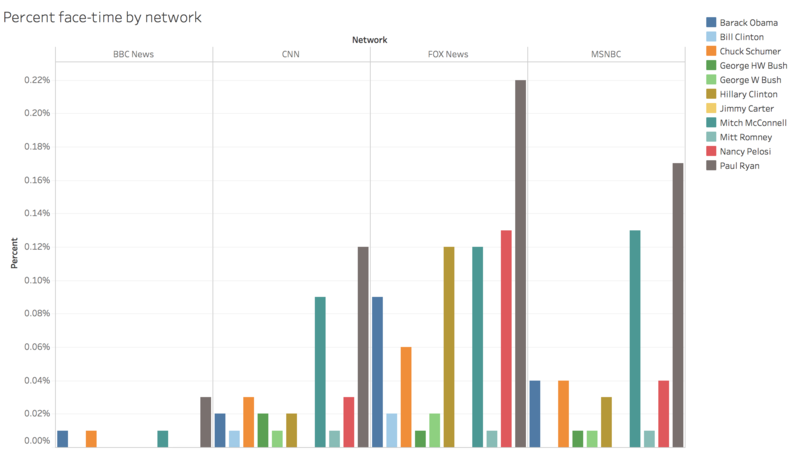 Here are six quick takeaways using Face-o-Matic for an analysis covering roughly six months, from November 2017 through May 2018, looking at four cable TV news networks: BBC News, CNN, Fox News, and MSNBC. Download Face-o-Matic data to explore your own research questions. 1. Trump trumps every other political figure in face-time on cable TV news, all the time, every day, in every way, on every network and program. As we’ve seen in past analyses with Face-o-Matic data, President Donald Trump is the major political star on cable TV news as compared to other top political figures examined. To put this in perspective: over a six month period stretching from November 2017 to May 2018, the president’s face appeared on TV cable news the equivalent of a full 13.5 days, counting every second of face-time. The next closest political figure we analyzed was House Speaker Paul Ryan, R., Wis., whose visage appeared the equivalent of one day. After Trump, GOP leaders in Congress are the most popular faces on TV cable news. The two GOP leaders in Congress, Ryan and Senate Majority Leader Mitch McConnell, R., Ky. are the next most popular faces on TV news cable news networks. Between the two, Ryan ranks first on the TV news cable networks we examined: BBC News, CNN, Fox News, and MSNBC. 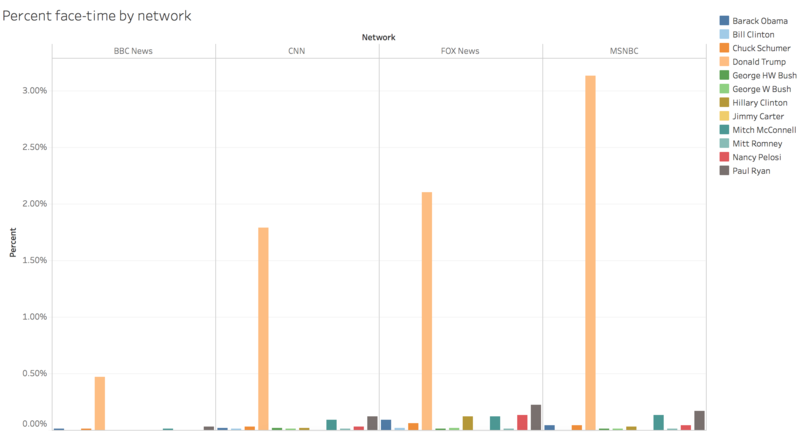 McConnell is the next most shown face on these networks, with the exception of BBC News. Link to interactive version of above chart, where view can be changed to exclude specific politicians. Hillary Clinton and Barack Obama figure prominently on Fox News. Fox News airs proportionately more images of failed presidential candidate 2016 Hillary Clinton and former president Barack Obama than other cable TV news networks. Fox News showed Clinton’s face 7.6 times more than CNN did, and Obama’s 3.6 times more. 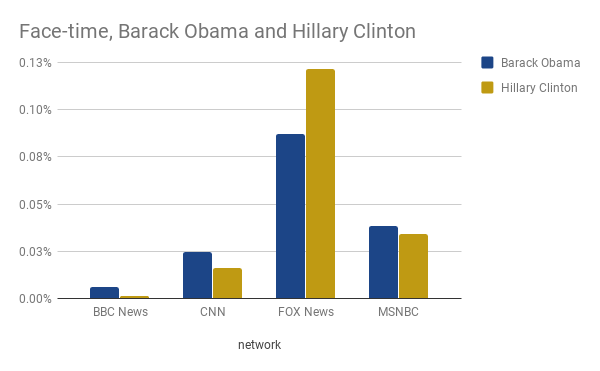 Fox News also showed Clinton 3.6 times more than MSNBC, and Obama, 2.3 times more. Hannity shows more Hillary Clinton face-time than any other top-rated Fox News show. 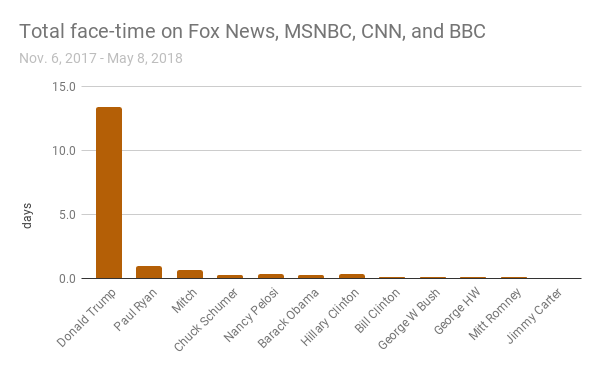 Not only does the Fox News “Hannity” program air more images of Hillary Clinton proportionately than any other top rated Fox News show, with just one exception, it is the Fox News show that shows her face more than current congressional leaders–Ryan, McConnell, Schumer or Pelosi. 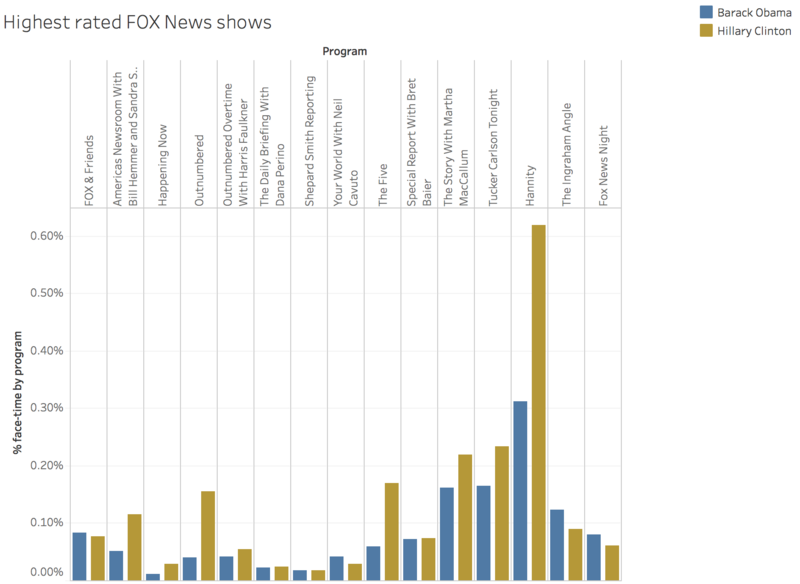 “Hannity” also shows more images of Obama than other top rated Fox News shows. 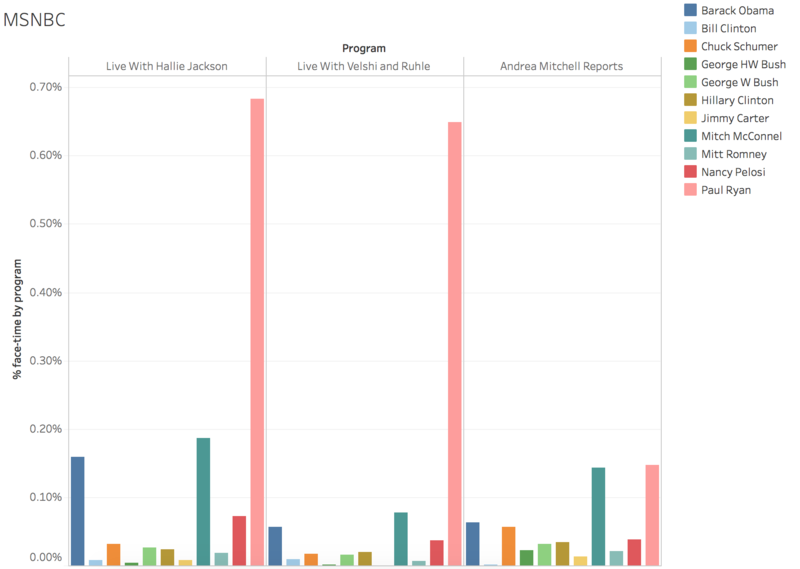 Ryan face-time spikes on news shows aired during morning hours. All three U.S. cable news networks examined showed high rates of face-time for Ryan on shows airing during morning hours, ranging from 9 am to 11 am. This may be linked to his leadership role in Congress and that morning hours are prime for large announcements. For example, on Fox News’ “America’s Newsroom” and “Happening Now” show spikes of face-time for Ryan. On MSNBC, “Live with Hallie Jackson” and “Live with Velshi and Ruhle” show high rates of images for Ryan. And on CNN, “At This Hour with Kate Bolduan” shows high rates of Ryan as well. Links to interactive charts for top-rated news shows; view can be adjusted to exclude specific politicians. The source for top-rated shows is shows with 2017 top viewership by Nielsen. BBC News just isn’t that into us. BBC News provides a window into how news is presented to a major foreign audience. Like U.S. cable news networks, BBC News features more face-time for Trump than other political figures examined. Ryan ranks a distant second. Overall, BBC News, however, shows much lower rates of images of U.S. political figures than U.S. cable news shows do. *Note: Our data set does not include Sen. John McCain, R., Ariz., who ran for president opposite Obama in 2008. Sample testing of facial detection for the senator revealed a somewhat frequent rate of false positives – instances where the identified face was not the senator’s, but rather one of a number of lookalikes. While we make no claim that all of the detections in the Face-o-matic data set are error free, we did test faces to minimize these. Please be sure to notify us if you find errors in the data. This entry was posted in Announcements, News, Television Archive and tagged Barack Obama, BBC News, Chuck Schumer, CNN, Donald Trump, Fox News, George H.W. Bush, George W. Bush, Hillary Clinton, Jimmy Carter, Mitch McConnell, Mitt Romney, MSNBC, Nancy Pelosi, Paul Ryan, TV news archive. Bookmark the permalink.